Ezequiel Szafir, a Doctor in Psychology, but also a former McKinsey & Co. consultant and an executive in many multinational firms with experience in both the US and Europe, brings to us the ultimate guide to understand and make Corporate Culture work for you. 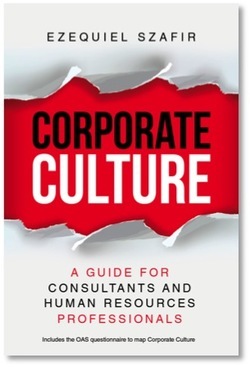 This book covers all you need to know about how Corporate Culture: how it is created and maintained, an introduction into the psychology of the individual that will allow you to understand the reasons behind people’s attitudes, and a guide to apply the Organizational Archetype Survey (OAS), a simple method to quickly map the Corporate Culture of any organization. A must read for anybody dealing with organizational issues. Written in an entertaining style, it will make you think and reconsider the way you have always thought about people in a work organization. Read it, quote it, take ideas from it for your next workshop, and then read it again. It is a practical, no-nonsense guide.